The sample is drawn into the analyzer through the SAMPLE bulkhead, as shown in Figure. From the bulkhead the sample is either shunted to a converter or bypasses the converter and is led straight through to a hydrocarbon kicker. When sample goes through the converter, the instrument response represents the combined sulphur (CS) reading, that is, the sum of SO2, H2S, and any residual reduced sulphur species. When bypassing the converter, the instrument reads SO2 only. The difference between the two signals is the inferred H2S reading. The sample, whether coming directly from the bulkhead or processed in the converter, then flows through a hydrocarbon kicker. 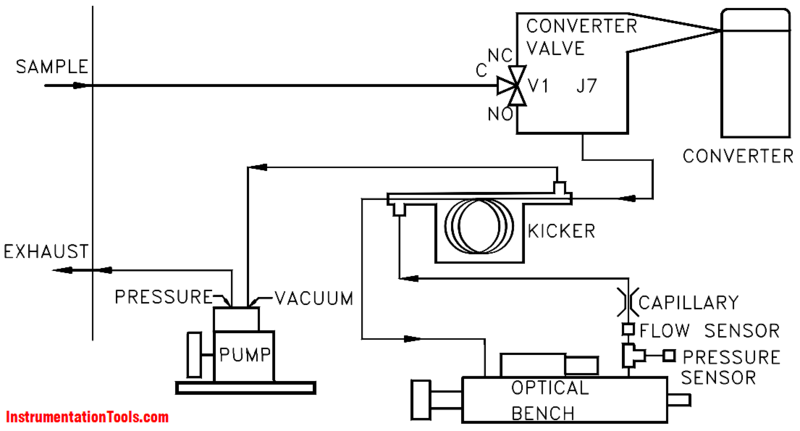 The kicker removes hydrocarbons from the sample by forcing the hydrocarbon molecules to differentially permeate through the tube wall. The SO2 molecules pass through the hydrocarbon kicker unaffected. The sample then flows into the fluorescence chamber, where pulsating UV light excites the SO2 molecules. The condensing lens focuses the pulsating UV light into the mirror assembly. The mirror assembly contains four selective mirrors that reflect only the wavelengths which excite SO2 molecules. As the excited SO2 molecules decay to lower energy states they emit UV light that is proportional to the SO2 concentration. The bandpass filter allows only the wavelengths emitted by the excited SO2 molecules to reach the photomultiplier tube (PMT). The PMT detects the UV light emission from the decaying SO2 molecules. The photodetector, located at the back of the fluorescence chamber, continuously monitors the pulsating UV light source and is connected to a circuit that compensates for fluctuations in the UV light. As the sample leaves the optical chamber, it passes through a flow sensor, a capillary, and the shell side of the hydrocarbon kicker. The analyzer outputs the SO2, H2S, CS ranges concentration levels to the display. Any supplier of Pulsed Fluorescence H2S Analyzer?